My previous post about the changes to DDL models in PeopleTools 8.48 made me to think about whether %UpdateStats() PeopleCode macro is the best solution to managing statistics on working storage tables in Oracle. Optimizer Dynamic Sampling was introduced in Oracle 9.0.2. as a solution to the same problem. When a query is compiled Oracle can collect some optimiser statistics based upon a small random sample of blocks for tables that do not have statistics and that meet certain other criteria depending upon the parameter OPTIMIZER_DYNAMIC_SAMPLING. In Oracle 10g the default value for this parameter changed from 1 to 2 and so dynamic sampling applies to ALL unanalysed tables. Thus, it should be possible to resolve the problem of incorrect statistics on a working storage table without explicitly collecting statistics during an Application Engine program, and therefore without needing a code change to add %UpdateStats(). Instead, simply delete statistics from the table, and lock them. A subsequent GATHER_SCHEMA_STATS will skip any locked tables. When a query references the table it will dynamically sample statistics and use them in determining the execution plan. However, there is one more problem to overcome. GATHER_TABLE_STATS will raise an exception on a table with locked statistics. If you want to use Dynamic Sampling on a table where %UpdateStats() is already used to update the statistics, the PeopleCode macro will raise an exception that will cause Application Engine programs to terminate with an error. The workaround is to encapsulate GATHER_TABLE_STATS in a procedure that handles the exception, and reference the procedure in the DDL model. It is not possible to put a PL/SQL block in DDL model. At this time I have no data to determine which method is more likely to produce the better execution plan. However, when performance problems occur in production they are instinctively routed to the DBA, who is likely to have difficulty introducing a code change at short notice. Dynamic Sampling has some clear advantages. Update 12.2.2009: Since writing this note I have come across some scenarios on Oracle 10.2.0.3 where the optimiser does not chose the best execution plan with dynamically sampled statistics, even with OPTIMIZER_DYNAMIC_SAMPLING set to the highest level, and I have had to explicitly collect statistics on working storage tables. I have adjusted the wrapper procedure to call dbms_stats with the force option on permanent tables (so it collects statistics on tables whose statistics are locked and doesn't raise an exception, although it does not use the force option on Global Temporary Tables. I still recommend that statistics should still be locked on tables related to PeopleSoft temporary records. The rationale for this is that you don't want any schema- or database-wide process that gathers statistics to process any working storage tables. Either the data in the table at the time the schema-wide statistics are gathered is not the same as when process runs and so you still want to use dynamic sampling, or else the process that populates the table has been coded to explicitly call %UpdateStats, and the new version of the wrapper will update these statistics. A recent thread on Oracle-L led me to look at how Oracle has changed the way that PeopleTools 8.48 collects Oracle Cost-Based Optimiser statistics. It now uses DBMS_STATS instead of the ANALYZE command. This has also caused me to reconsider some options for managing statistics for a PeopleSoft system. Application Engine programs can collect Cost-Based Optimiser statistics on specific tables by calling the %UpdateStats([,high/low]); PeopleCode macro. This uses one of two DDL models depending on whether the high or low option is specified. However, these DDL models only exist for Oracle and DB2/MVS. %UpdateStats() has no function on other platforms. This was PeopleSoft’s platform generic solution (before their takeover by Oracle, and before Dynamic Sampling was available in the Oracle database) to the very real problem that occurs when statistics on a working storage or reporting table, that is emptied, repopulated and used during a batch process, do not accurately represent the content of the table and hence cause the optimiser to choose an inappropriate execution plan. PeopleSoft provided a method of refreshing the statistics during the process, and introduced new DDL models because each database platform would have its own command. However, this approach relies upon developers to add the %UpdateStats() macro for every occasion where data has changed sufficiently to require refreshing the statistics. Unfortunately, developers are not always best placed to make that decision. There are still plenty of places in delivered PeopleSoft code where this macro could be usefully added. From PeopleTools 8.48, these DDL models now call the Oracle supplied PL/SQL package DBMS_STATS. The high option still performs a full compute of statistics. While the low option estimates statistics with the sample size determined by the pseudo-variable. DBMS_STATS.AUTO_SAMPLE_SIZE. So it would appear that PeopleSoft now follow the recommendations that Oracle have been making since version 8i of the database to use DBMS_STATS instead of the ANALYZE command. This is certainly a step in the right direction. It also makes good sense to use the automatic sample size. ESTIMATE_PERCENT defaults to DBMS_STATS.AUTO_SAMPLE_SIZE from Oracle 10g. Previously it was NULL, which caused a full compute. 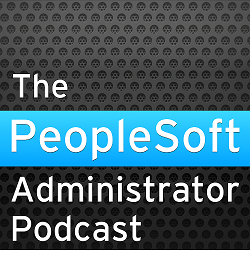 PeopleSoft have chosen to specify the METHOD_OPT as FOR ALL INDEXED COLUMNS SIZE 1. If you have specified histograms on any of your columns, or generated them automatically with DBMS_STATS, the PeopleSoft command will remove them from indexed columns and will leave any histograms on unindexed columns unchanged, and potentially out of date. The default in Oracle 9i is FOR ALL COLUMNS SIZE 1. This removes all histograms on all columns, although this is at least the same behaviour as the ANALYZE command. In Oracle 10g, METHOD_OPT defaults to FOR ALL COLUMNS SIZE AUTO. The Oracle manual states that the database ‘…determines the columns to collect histograms based on data distribution and the workload of the columns’. So, Oracle may remove histograms if it judges that they are not necessary. I have no hesitation in recommending that value for METHOD the delivered DDL models should be changed. I would suggest using FOR ALL COLUMNS SIZE REPEAT. Addendum 12.6.2007: I have noticed that the DDL models change again in PT8.48.07. The full compute is now for ALL COLUMNS, but the estimate is still for ALL INDEXED COLUMNS! Closer, but still no cigar!